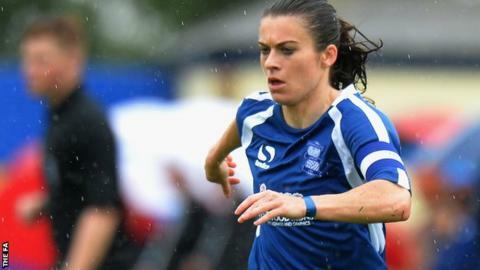 Karen Carney has said she thought about her costly penalty miss in last year's title race when she stepped up to help edge Birmingham City to Women's Super League One safety on Saturday. The forward earned and converted two spot-kicks in a 3-0 win over Bristol to move Blues five points clear of danger. On the final day last term, she was denied against Notts County in a game they needed to win to claim the title. "That penalty from last season will always scar me," Carney told BBC Sport. "But I want to do better and be better. It won't define me. "I still think about it every day and every night when I go to sleep. I won't ever forget that. "I did pick the ball up and did think it. I know how good Mary (Earps) is in goal, but I focused and believed in my own ability, believed in my confidence and thankfully they went in." Birmingham City's last remaining league matches are away from home, with a trip to Notts County followed by a final day game against Arsenal. Bristol Academy can still stay up ahead of Birmingham if they can beat title-chasing Manchester City and Liverpool and Blues fail to collect a point. Birmingham need only a point to secure their top-flight status for next season. However, if Bristol fail to win both their remaining two matches, Blues will also be safe. England international Carney said victory over their relegation rivals would "not mask" the difficulties of 2015, having come within a goal of winning a maiden title and featuring in the Champions League semi-finals last season. "Somewhere along the line it has gone wrong and we have to hold our hands up as individuals, as a team and staff and come together and be better next season," she added. While Birmingham have struggled with injuries and laboured in front of goal for much of the season - scoring as many goals against Bristol on Saturday than they had managed in 11 previous league matches this season - Carney insists the quality of the competition accentuated their shortfalls. "You have to give credit to the league, not just look at our faults," she said. "Every team has gone on and gone up another level and that is how competitive the WSL is."